Although Dorie intends this tart to be a breakfast or tea-time treat, due to my work schedule this week, we enjoyed ours for dessert. As you can see from the picture, I made a couple of indiviual tarts so I wouldn’t have soggy leftovers. One night I used some little purple plums, hardly bigger than golf balls. They softened up quickly in the oven, which is good because the brioche browned awfully fast! The next night, I pressed out a couple more shells and used sweet cherries instead. With a little vanilla whipped cream, both were good, but I think I liked the cherry tarts better…next time, I should give it a go with apricots and a bit of my homemade jam! The recipe, of course, is in Baking: From My Home to Yours by Dorie Greenspan, and is also on Chez Us. Don’t forget to check out the TWD Blogroll and Denise’s post over at Chez Us! Love your mini tarts – they look delicious Steph. That looks so scrumptious, with all the gooeyness dripping from the sides. I’m so wishing I had made this–just didn’t have the time this week! This looks fantastic. I would have never thought of using brioche in this way. 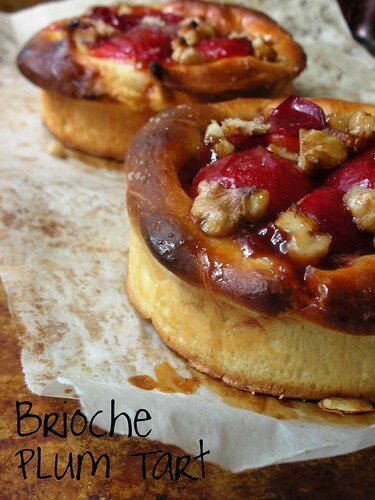 I love brioche – any time of day! I definitely must try this. Loving the oozy-ness on the front tart! The other TWD bakers will have to seriously be good to beat this!!! Beautiful! This was my first experience with brioche and I’m learning so much about how to use the dough by reading everyone’s blogs. Love your little tarts! Gorgeous, gorgeous — as always! The mini/single serve size is a great idea – did you use small ramekins (with the straight sides) or something different? Jeff– I have some small tart rings with straight sides (they are sometimes called “flan rings”) that I bought at a restaurant supply. Made by Matfer, I think…I use them all the time. Love those mini’s girl. They look luscious!! Great looking tarts! I will have to try cherry next time. I’ve been daydreaming about brioche, and now it’s a full-blown craving! This looks lovely and homey and deeply satisfying. These are gorgeous. I love the cherries and the juices flowing over the side. Great photos! Totally gorgeous! This is perfectly acceptable as brunch or dessert which means lots more opportunity to enjoy it! WOW! This is what I call capturing the true rusticity of a countrylike dish. Your tarts are stunning! I also went with cherries and loved the result. Your tarts look mouth watering!!!!! As always you did an amazing job. Beautiful. I want to try the little cherry one. I’m sure that was delicious. I’m going to have to make this again with different fruit. Wow, your tarts look incredible! I totally agree, looks just like a European bakery!! Nice job! Great looking brioche. I love the walnuts! Your tarts look perfect! Very pretty. c’est super réussi et j’adore en version individuelle ! OH!! Those minis look great. Really pretty – I love the smaller size. Your tarts are so beautiful! Cherry tarts sound delicious. I’m a bit late with mine this week – just making it now! I just knew I would come a visiting and you would have something that would just blow me away! Your styling on this is absolutely gorgeous…so rustic and yet so elegant at the same time. They look wonderful…great job. What a unique dessert- I love making sweet bread dough, but I’ve never utilized it in a tart before. I LOVE plums in the summer, but don’t use them often in baking. I’ve had my eye on Dorie’s Dimply Plum Cake for quite some time, and was thinking of making it before summer’s end. I know you made it with peaches last September… if you had to pick just one to make- which would you recommend? Your photos are beautiful (as usual 🙂 and the nuts look like a lovely textural contrast to the softened fruit. Great job and thanks for showing me yet ANOTHER recipe to add to my “must-try” list! Have a great weekend, Steph! Hi Joy! I think, if I had to pick one, I’d make the cake. But then again, I’m a sucker for cake! I love how they are dripping w/juices! !